Ariana Grande might have said “Thank U, Next” to her past relationships, but when it comes to engagement rings, she has some other feelings. After calling off her engagement to Pete Davidson last month, it seems like nothing is stopping the 25-year-old singer. She has another album on the way, she was named Billboard‘s 2018 Woman of the Year, and, well, she’s speaking her damn mind on social media. Seriously, we’ve never said “bloop” so many times in one week, and her latest comment might be her best one yet. 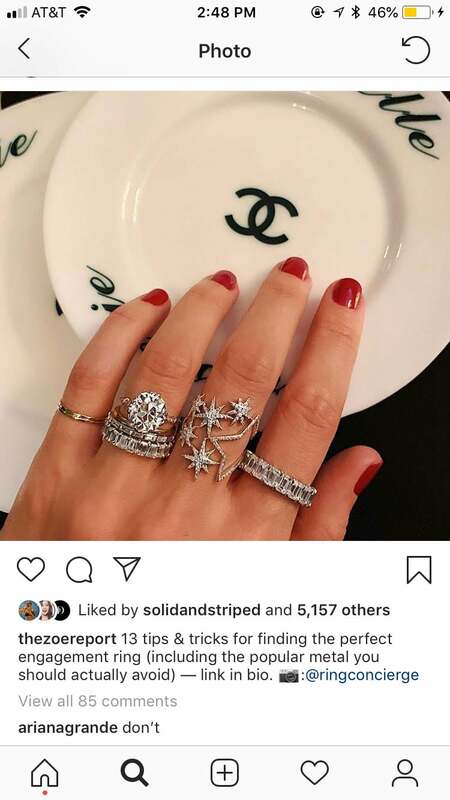 On Thursday, The Zoe Report posted an Instagram photo of a hand with a slew of diamond rings and a gorgeous engagement ring right in the centre. “13 tips & tricks for finding the perfect engagement right (including the popular metal you should actually avoid),” the photo read, and Ariana’s one-word comment has the internet in tears. She replied, “don’t,” and we immediately turned into the “Supa Hot Fire” meme. Check out the comment below, then check out Ariana’s sexiest music videos.